This saphirre- colored body of water welcomes visitors to swim and savor the tropical setting. Just a few minutes walk up a quiet dirt road from the Cave at Roaring River is a natural wonder nestled in a quiet garden. This attraction is another one of JuJu’s favorite off-the-beaten-path adventures and the perfect activity to pair with Caving at Roaring River or Mayfield Falls. Attraction open seven days a week. Pickup time set at customer’s preference. 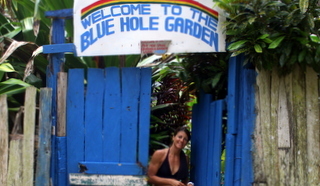 Blue Hole Gardens is an hour drive from Negril. Blue Hole Gardens is an hour and forty five minute drive from Montego Bay. Guests may only swim when water is high enough. Guests should bring their bathing suits and a towel. unlimited refreshments (rum punch, Red Stripe & water) and a complimentary collection of hi-res photos.